I'm playing catch up with my Bread Baker's Apprentice Challenge and made Peter Reinhart's recipe for Cinnamon Raisin Walnut Bread (which you can get from his book above, starting on page 147-149.) This was a great recipe to make... and I have plans to use some of the bread to make a Cinnamon Raisin Walnut Bread Pudding soon! 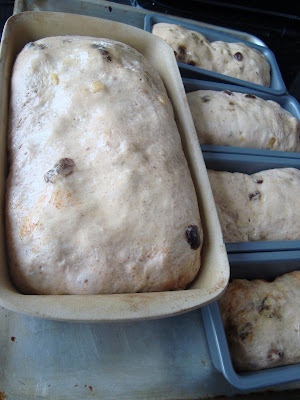 The dough for this bread is made with yeast, flour, sugar, salt, butter, buttermilk, egg, cinnamon, raisins and chopped walnuts. Once the dough is formed, it's placed in an oiled bowl to rise and double in size. 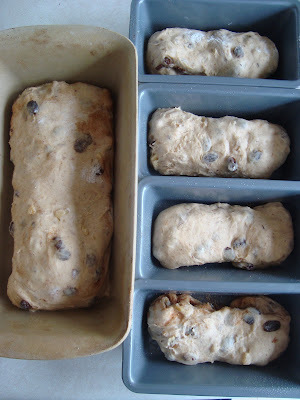 This dough is then rolled out into two rectangles as the recipe yields standard loaves. I planned on making 1 standard loaf and 4 mini loaves to give away as gifts so I made 1 large rectangle and 4 small ones. 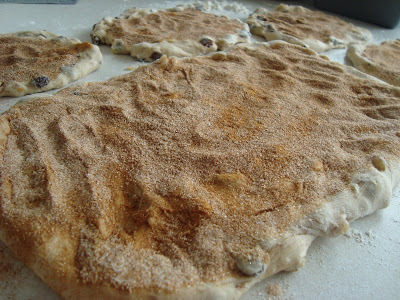 A mixture of cinnamon and sugar is sprinkled over the rolled out doughs. 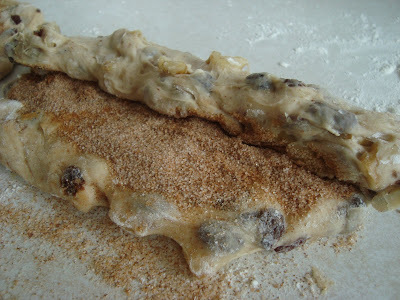 Carefully, each piece of dough is rolled into a log, making sure the cinnamon sugar doesn't spill out of the sides. The cinnamon sugar will eventually be the "cinnamon swirl" in every slice - which is my favorite part! Once all the doughs have been rolled, they are placed into loaf pans for their second rise. Finally, it's time to bake and fill up the kitchen with the wonderful smell of cinnamon. Seriously, after making this bread, I don't think I'll ever buy commercial cinnamon raisin walnut bread from the store ever again! This looks *so* good. 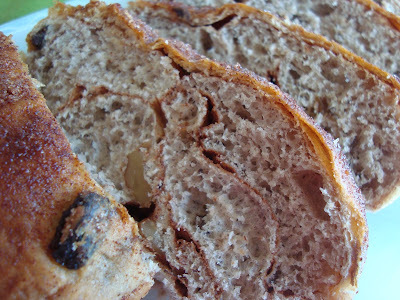 Cinnamon raisin, yes, but walnuts take it to a totally different level! I bet this would be phenomenal as french toast. Both this bread and the cranberry one below look awesome! I envy your patience for bread baking! The small loaves are a good idea for gift giving. I love this bread too, so much better than store-bought. Love, love, love the mini-loaf idea! I think I'm going to have to start doing that with the rest of the recipes in the book; trying to find a way to make them into sizes more appropriate for just the two of us. Good job with your bread!